Earlier today, a strange sight appeared in the Pearl River Delta area of Guangzhou. 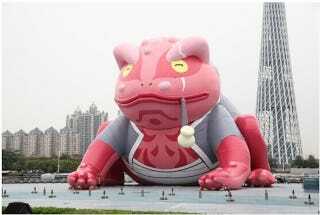 A giant blow up toad smoking a pipe is seen tied down near Guangzhou's Canton tower. According to Sina games, the giant toad is a tribute to the 15 year-old Naruto comic series that just came to an end last week. Sina games talked to a worker at the site who said that the balloon was put up by fans who wanted to commemorate the series conclusion. The same construction worker claims that the toad weighs in somewhere around 2 tons. The toad is a character from the series called Gamabunta. He's a giant toad that's summoned by the series' titular character and his father, the fourth Hokage. The character also plays a fairly important role in the series as one of the symbols of the "three ninja of the leaf." According to Sina, since the debut of the toad in Guangzhou, fans have been lining up to take selfies with it. Course, this version of Gamabunta is much less surly than his manga counterpart, even if he's just about as large. One intrepid fan has even uploaded the toad onto Tencent maps! You can check out the frog and its surroundings here. Chinese netizens have multiple theories as to who put the balloon up. Some believe that the balloon was actually put up by fans. Some have even made a joke that this was the work of artist Florentijn Hofman, the creator of the floating yellow duck. Others speculate that the balloon was the work of a marketing company hoping to draw up hype for the online game, Naruto Online. It's not uncommon for Chinese video game companies to co-opt feel-good moments for publicity. Course, I personally want to believe in super fandom. The Chinese Naruto Online game is currently in beta.